Da Capo Press, 9780306812859, 432pp. The public called him Scarface; the FBI called him Public Enemy Number One; his associates called him Snorky. But Capone is the name most remember. 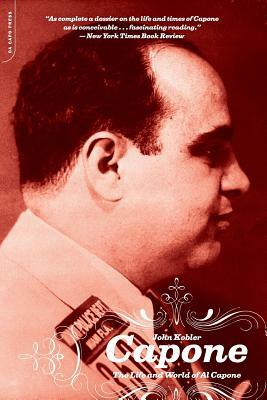 And John Kobler's Capone is the definitive biography of this most brutal and flamboyant of the underground kings—an intimate and dramatic book that presents a complete view of Al Capone and his gaudy era. Here is Capone's story: his violent childhood in Brooklyn, his lieutenancy to Johnny Torrio, his rise in the ranks of the underworld, the notorious St. Valentine Massacre, his eventual control of the entire city of Chicago, and his decline during his imprisonment in Alcatraz. Capone was the ultimate gangster, and Capone is the ultimate in gangster biographies—a classic in the literature of crime.